WEST GREENWICH, R.I. — Last spring ecoRI News unintentionally logged a runoff complaint against Hopkins Hill Sand & Stone LLC, so as the one-year anniversary approaches, we decided to check on its status. First, some background. During a 2-hour Big River Management Area hike on April 17, 2018 with Rhode Island mapmaker and concerned resident Cliff Vanover, plenty of evidence of runoff damage was observed in the 8,319-acre South County woodland, such as accumulating silt on rocks and stream beds and out-of-place gravel and stones that could only be classified as washed-away quarry debris. Even though DEM said it hadn’t received any runoff complaints concerning Hopkins Hill Sand & Stone, the state agency knows the business has been operating without a Rhode Island pollutant discharge elimination system (RIPDES) permit since at least fall 2004. Neither ecoRI News nor this reporter requested that a complaint be filed, and the reporter informed the DEM spokeswoman that wasn’t the nature of the organization’s media request. It was a request to speak with someone from the state agency about possible runoff problems in the Big River Management Area. No one was made available for an interview. Hopkins Hill Sand & Stone operates a quarry that borders the Big River Management Area. ecoRI News recently asked DEM, via e-mail, if it had taken any action against Hopkins Hill Sand & Stone concerning our “complaint” about waste runoff being discharged into the Big River Management Area. A noncompliance letter dated June 14, 2018 required a RIPDES application be submitted by July 16, 2018. The letter noted that Hopkins Hill Sand & Stone is in violation of the federal Clean Water Act and state law. “We don’t know when the discharge began. The letter advised the company of the need to apply for a permit for the discharge, which the company did not do,” the DEM spokeswoman responded via e-mail to follow-up ecoRI News questions. DEM hasn’t conducted any another inspections of the property since early last May, according to the agency spokeswoman. The June 14, 2018 letter gave the operation three choices: submit a RIPDES application; eliminate overflow discharges of sand and gravel wash-waters and submit a multi-sector general permit; or eliminate all discharges. A subsequent letter dated July 16, 2018 extended the company’s RIPDES application deadline to Aug. 27, 2018, to allow the operation to eliminate a “gap in the weir” that resulted in the discharge. A letter dated Oct. 26, 2018 was written in response to Hopkins Hill Sand & Stone’s RIPDES application. The letter noted five deficiencies that need to be corrected before the application can be considered. Hopkins Hill Sand & Stone had until Dec. 1 of last year to respond to DEM’s deficiency letter. As of March 18 of this year, no response had been received. The quarry “has not formally responded to the letter and it has not addressed the requirements of the letter,” according to DEM. Mining and blasting at the quarry creates runoff waste that accumulates on the side of a paved road that leads to Hopkins Hill Sand & Stone. The quarry’s waste eventually washes into the state-protected management area that borders the operation. Hopkins Hill Sand & Stone, an arm of the Cardi Corp., sells washed concrete sand, washed asphalt sand, bank gravel, and pond fill, among other products. The mining operation, which borders the Big River Management Area, also conducts blasting, as these Facebook and YouTube videos show. 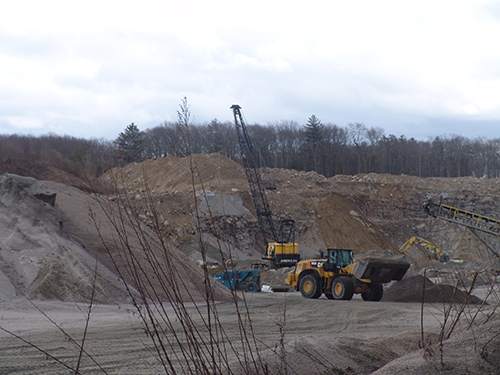 For last April’s story, ecoRI News spoke with Steve Cardi II, a managing member of Hopkins Hill Sand & Stone, about quarry runoff concerns. He blamed the “unbelievable” rains of the past month for any current issues. He said the operation every spring checks on its erosion controls, such as silt fencing and hay bales.